The blood circulatory system pumps blood and nutrients necessary for the body to function. 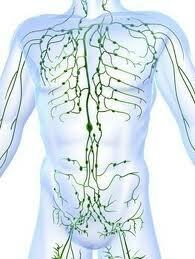 The lymphatic system transports the extra fluid, protein and waste that leaks out of the blood circulatory system into the tissue back into the bloodstream. This protein rich fluid known as lymph travels through capillaries and vessels to lymph nodes then through that thoracic duct and back to the blood circulation. The lymphatic system helps to maintain the fluid levels in the body (homeostasis), is responsible for the immune process and absorbs fat from the intestines. Lymphoedema occurs if the lymphatic vessels or nodes are missing, damaged or blocked lymph builds up in the tissues causing them to swell. Long-term the tissue thickens, becomes fibrotic and fat deposits develop. Skin changes, reduced range of motion and heaviness may also occur. Swelling that is constant or comes and goes in any part of the body. A firm finger pressure leaves an indent on the skin after the pressure is released. Feelings of heaviness, tightness, tension, aching or stretched skin. Jewellery or socks becoming tight or leaving indentations. Skin breakdown, discolouration, rash, irritation or hypersensitivity in the swollen areas. If you experience any of the following signs and symptoms, you may benefit from an assessment by a qualified lymphoedema physiotherapist at Rathmines Physiotherapy and Sports Injury Centre. WHAT HAPPENS IN A LYMPHOLOGY CONSULTATION? Patients are initially assessed for 60 minutes. Depending on their condition follow-up appointments are 60 -120 minutes. Assessm ents are conducted by physiotherapists and involve a thorough verbal and hands-on component. Assessments and treatments are conducted in a private room. Treatment known as CLT may include; specific sequential massage, multi-layer lymphoedema bandages, garment prescription, skin care, deep breathing and exercises. 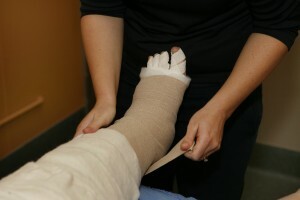 Treatment of lymphoedema is not painful. Optimal improvement relies on the client being an active participant in the programme. WHAT IS THE GOAL OF LYMPHOLOGY? The goal is for improvement or better management of the lymphoedema. Goals may include; reduced swelling, restoration of normal skin condition and texture, soften areas of fibrosis, increase range of motion, reduce pain and improve quality of life. Private clients: no referral needed. For Medicare, Veteran’s Affairs, Third Party and Workcover clients a referral is needed. Consultations can be claimed through private health insurance if physiotherapy is a component of your policy. Consultations may be covered under Medicare, Veteran’s Affairs, Third Party and WorkCover. Follow-up consultation – ½ hour to 1½ hour physiotherapy appointment. For exact costs or to make an appointment please contact reception at Rathmines Physiotherapy and Sports Injury Centre on (02) 4975-1622. If you have any questions about your condition please contact Jacqui Eaton or Karen Rolfe on (02) 4975-1622.